It is almost impossible to prevent water damage in a home or building. With numerous potential causes, including, rain, flooding, leaks, pipe bursts, overflows, sewage backups, and more, water damage is known as one of the most common disasters for building materials. But regardless of the cause, water damage requires immediate attention. Spreading until the source is cut off, the water can cause permanent damage without emergency treatment. ServiceMaster by Restoration Contractors is a local business that has been providing professional water damage restoration services in Fort Wayne and all of Northeastern Indiana for both commercial and residential properties since 1975. What that means is that when it comes it comes to water damage restoration in Fort Wayne IN we’ve seen and done it all and we can definitely help you as well. Our specialized water extraction and drying equipment are efficient when removing water from the affected areas, pulling it out of the structure while eliminating the excess moisture in the air. Any amount of water in your home or building can result in severe damage as it spreads through porous materials. As water becomes absorbed into drywall, flooring, wood, carpeting, and other materials, the result can include discoloration, warping, swelling, and permanent structural damage. But if it is left to sit without treatment, the area will begin to smell musty from the combination of excess moisture, bacteria, and cellulose in porous surfaces. Mold will then be a problem as it can develop within 48 hours of water damage, dispersing its spores into the air and affecting new surfaces. For that reason, call a company that specializes in water extraction as soon as possible. Depending on the severity of water damage in your home, our plans are customized for your home’s needs. If you have questions about the water damage plans offered, call our emergency service number at (260)420-1502. 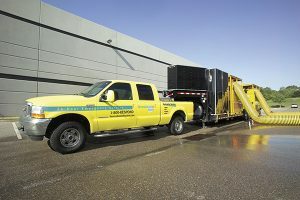 Our technicians at ServiceMaster by Restoration Contractors can handle all levels of water damage, using advanced water extraction equipment and techniques. We will effectively remove any amount of water including standing flood water and restore water damaged furnishings and building materials. Call ServiceMaster by Restoration Contractors at the first sign of water damage to prevent it from spreading further. Remove temporary flooring like rugs, but do not try to remove carpeting or other permanent flooring. Keep your drapes off the floor by putting the drapery bottoms through a coat hanger and putting the hanger on the rod. Wipe excess water from the furniture and put aluminum foil between the furniture legs and carpeting. Store photos, important documents, and valuables in a safe, dry location. Keep water damaged books packed tightly on their shelves to prevent page warping until they can be treated with a specialized drying process. Keep the doors in your home open to speed up the drying process. Do not walk into a room with standing water unless the power is turned off. Do not try to remove water with a standard vacuum cleaner. Do not try to remove permanent flooring, leave this to professionals. Do not use appliances until the area is dry and they are deemed safe to use. Do not try to cleanup mold growth. Time is of the essence when dealing with water damage because it will continue to spread until its source is removed. At ServiceMaster by Restoration Contractors, we are available 24/7 and will arrive in a timely manner with all equipment needed to remove excess water and moisture while making the necessary repairs to return your property to its original condition. Directions from ServiceMaster by Restoration Contractors to Johnny Appleseed Park. Head south on Short St toward Spring St. Follow Wells St to Fernhill Ave in Washington Township. Continue on Lima Rd to Wayne Township. Take Spy Run Ave Exd to Parnell Ave in Washington Township. Turn right onto Parnell Ave. Turn left onto N Harry Baals Dr. Arrive at 1500 N Harry Baals Dr, Fort Wayne, IN 46805. Directions from ServiceMaster by Restoration Contractors to Fox Island County Park. Head south on Short St toward Spring St. Turn right at the 1st cross street onto Spring St. Continue on Lindenwood Ave to Illinois Rd/W Jefferson Blvd. Follow W Jefferson Blvd to Randall Rd. Take N Washington Rd to Covington Rd. Follow Smith Rd and Yohne Rd to Fox Island Entrance Rd in Aboite Township. Drive to Nature Center Rd. Arrive at 7324 Yohne Rd, Fort Wayne, IN 46809.